The business collaboration app that makes teamwork simple! We know life in a busy office environment is never simple. Today, companies utilize a range of document management tools, each of which has their own unique features and pitfalls. As a team leader, you likely have multiple email updates, IM notifications and word processing documents on your screen at one time. Your focus continually travels to the next flashing window. Team-One is here to help you wrestle back your focus and simplify your life at the office. The system is designed for seamless integration with Google Drive, Salesforce and all the other tools you need to make work simple. It also comes with out-of-the box connectors, as well as widget and rest APIs to offer complete compatibility with all your unique business applications. With Team-One, your teams will always be on the same page. The entire system is engineered to support effortless collaboration and to help teams achieve their highest objectives, together. Team-One is built with click-to-call capability, and allows you to quickly setup and manage live meetings directly from your customized workspace. We’ve built Team-One with intuitive drag and drop for file sharing. You’ll be able to share documents across workspaces easily, while maintaining the highest level of data security. Teams will also benefit from comprehensive document search capabilities, gaining access to required data in seconds. With direct messages in Team-One, you’re never more than a click away from personal 1-to-1 interaction with your individual team members. Our system supports the highest level of conversational discretion and allows you to communicate with precision. You’ll be able to invite external team members to your Team-One application effortlessly. This ensures that data and important documents can be shared without having to overcome time-consuming communications roadblocks. Our all-in-one solution helps mitigate the costs and logistical challenges involved in buying and managing tools from different suppliers. Have your team in one place with Team-One, keeping your entire workforce moving in one direction with Microsoft 360 and Dropbox. Our system helps mitigate information loss and allows you to organize information in logical workflows for fast data retrieval. Regain as much as 1/3 of your work-week with Team-One’s management tools to insure organization and keep you productive. Team-One helps you build and nurture strong customer relationships and collaborate and share while helping customers achieve their goals. 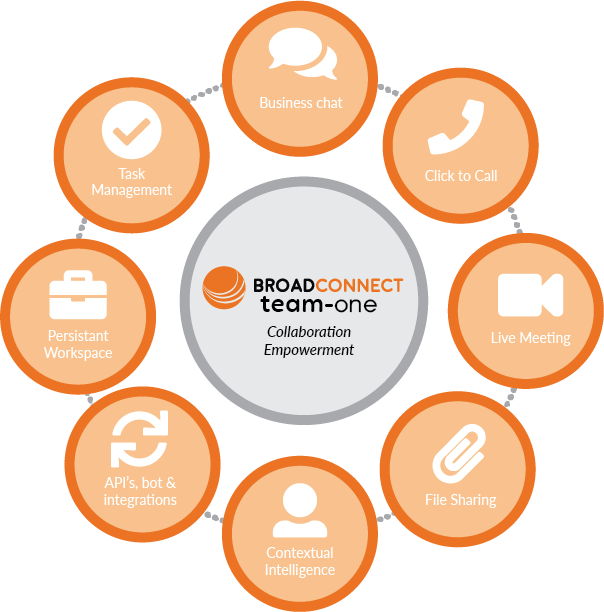 BroadConnect supports businesses of all sizes through an advanced portfolio of enterprise-ready cloud PBX, unified communications, team collaboration and contact center services. As with UC-One, CC-One and all of our communication applications, Team-One is delivered over our carrier-grade private network, which integrates the Broadsoft BroadWorks and BroadCloud platforms for optimized mobility, openness and security.